The end-of-line system is fully automated. The only required manual operations come from loading blank cases into the case packer and film onto the stretch wrapper. To save space the control panel for the case packer and Currie by Brenton robotic palletizer has been consolidated into one compact unit and mounted directly to the frame of the Mach-2 case packer. As cartons enter the Mach-2, a vision system verifies that printed barcode and human readable information on the cartons are correct for each unit. Cartons with incorrect information are automatically rejected before being packed into cases. As cases exit the Mach-2 each is check weighed before being handled by the robot. Any incorrectly weighted case is automatically picked up by the robot using vacuum pick tool and placed on a reject lane. Every in-specification case is picked up by the robot, which then moves the case to a labeler and then to a vision system. Like the first vision station, this vision system verifies that the barcode and human readable information on the label are correct. The system’s end-to-end quality control features are foundational to tracking and tracing pharmaceutical products. The robot is mounted directly on the frame of the case packer, saving considerable floor space. Another space savings aspect is that the robot builds pallet loads directly on the base of an Orion Packaging FA turntable automatic stretch wrapper. After the stretch wrap station, pallets will index forward to the de-palletizing area of the active demonstration. The HMI for the case packer and the robot have been integrated for unified operation and utmost ease of use. Control of the robot is carried out through the HMI, a much simpler and more intuitive process than programming movement through a teach pendant. The Mach-2 at the show demonstrates an eight-video camera system for monitoring and diagnosing operational issues with the machine. The video system provides real time and archived video footage with the cloud-based remote monitoring and remote services ProTech by Pro Mach™ system. ProTech is being introduced by Pro Mach at Pack Expo. The Mach-2 case packer is an all-servo driven, side load case packer utilizing indexing motion to load up to 35 cases per minute. 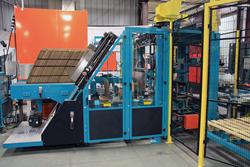 Cases accommodated include RSC, HSC, tray, wrap-around, knock-down, and harness for cartons, bottles, cans, and tubs. The Mach-2 minimizes the environmental impact of packaging operations through the appropriate use of electronic and servo drives, resulting in less wasted energy and product and packaging materials. For more information on Brenton, call 800-535-2730 and visit http://www.BrentonEngineering.com. Pro Mach is a leading provider of integrated packaging and processing products and solutions for food, beverage, consumer goods, pharmaceutical, and other diverse companies. Through its brands, Pro Mach provides product packaging and processing equipment, PMMI certified training, installation, parts, and service in Bottling & Capping, Primary Packaging, Flexible Packaging, Material Handling, Labeling & Coding, and End-of-Line Packaging. Pro Mach has a diverse customer base, from Fortune 500 companies to smaller, privately-held businesses worldwide, which depend on reliable, flexible, technologically advanced equipment and integrated solutions. Pro Mach is headquartered near Cincinnati, Ohio, with manufacturing facilities and offices throughout the United States, Canada, Mexico, and Europe. For more information about Pro Mach, visit http://www.ProMachInc.com.